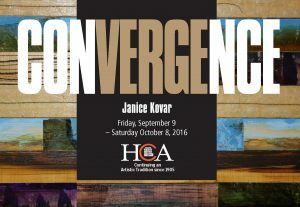 Janice Kovar is a contemporary abstract painter who works in a mixed media format that includes wood, plaster, text, encaustic, and collage. Her sculptural assemblages explore themes about the construction of landscape, geology, manufacturing, and the cycles of time in the natural world. Janice received her B.A from McMaster University in and Art and Art History in 1986, as well as a teaching degree from Queen’s University in 1989. She currently lives and teaches in the Hamilton area and has taught visual art at the secondary level for over 20 years with the H.W.D.S. B. Her most recent exhibitions include, The Contemporaries: A Reunion Show at You Me Gallery, The Whirligig Show, and Art in The Workplace at McMaster Innovation Park.